The entrance to the library features automatic door openers. Lawrence Public Library has three accessible restrooms (Two on the main floor and one in the lower level). Restrooms near the library entrance and those on the lower level have power assist doors. There are two accessible parking spots outside the library’s entrance on Vermont Street and four accessible parking spots in the Vermont Street parking garage to the south of the library. Our facility is equipped with an elevator to provide access to the lower level. Manual wheelchair available upon request for use in library. The library has a limited number of small, wheeled shopping carts parked near the Welcome Desk for patrons who are unable to carry items while they browse. There are also hand-held baskets located in the atrium and tote bags available to purchase at the Accounts Desk for $1 each. 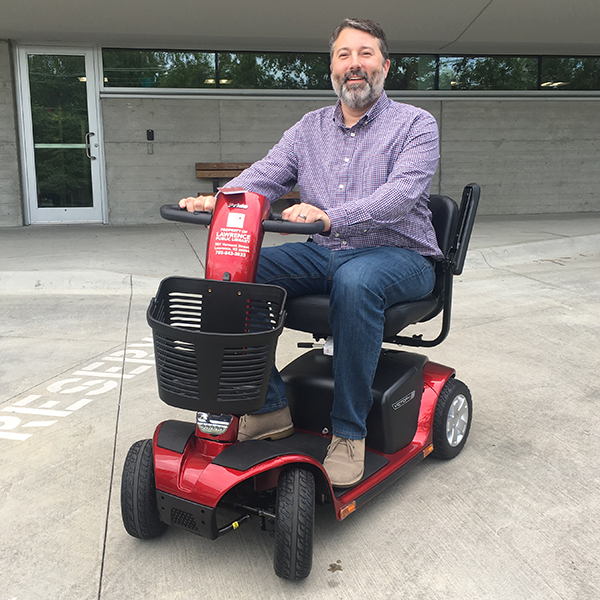 Located near our Welcome Desk, visitors can borrow our motorized scooter for up to 2 hours inside the library. Just ask for the key when you're ready to roll. Staff at service desks are available to assist patrons with searching for and retrieving hard-to-reach items in the stacks and fixing technology issues. If you are able to, please stop by one of the service desks to inquire about staff assistance. If you need assistance in order to gain entrance to the library and/or reach a service desk, please call ahead to determine a plan for assistance (785-843-3833). We are always happy to help. Whether you love mysteries, westerns, or biographies, we’ve got a great selection of nonfiction and fiction in our large print collection (14+ point lettering). Our sound system in the auditorium is equipped with a hearing loop, which transmits sounds electromagnetically for those with assistive hearing devices. Kansas Talking Books provides personalized library support materials for any Kansas resident with a visual impairment, physical impairment or reading disability. For more information or to apply for services: http://kslib.info/153/Talking-Books, or call 800-362-0699 or 620-341-6280. The Kansas Audio-Reader Network is a free reading and information service for blind, visually impaired, and print disabled individuals in Kansas and western Missouri. Newspapers, magazines and best-selling books are read on the air and on the internet, 24 hours a day. Applications are available at reader.ku.edu, or by calling 785-864-4600. Independence, Inc. is a nonprofit resource center for people with disabilities in Lawrence that offers a variety of services and programs including: advocacy, independent living skills training, referrals, peer support, an equipment loan bank, financial management services, a Youth Employment Program, an Assistive Technology Grant Program, and the Kansas Telecommunications Access Program. They also have a Computer Learning Center with eleven computers featuring a variety of assistive technology, including screen readers for Windows, screen magnification, voice input, alternative keyboards, trackballs, keyboard modification software, scanners, and a Braille printer. For a full list of services, you can check out their website or give them a call at 785-841-0333. When using Relay Kansas from a pay phone, local calls will be free of charge. Calling cards may be used for toll and long-distance calls, and the call will cost no more than if you used coins. Collect calls may be placed by providing the Communications Assistant your name and the area code and telephone number you wish to call.